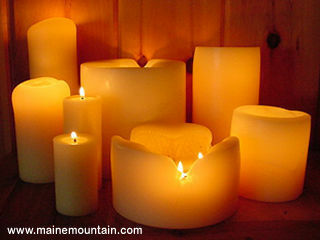 Candle Burning Tips — Maine Mountain Soap & Candle Co.
All Candles: NEVER leave a burning candle unattended. Trim all wicks to 1/8" - 1/4" before lighting. Remove all debris from the wax pool. If the flame gets taller than 1", extinguish flame, trim wick to 1/8" - 1/4" and relight. Our Votive Candles are designed to turn to liquid wax when they burn, therefore they need to be burned in a holder designed for votive candles. Our Jar Candles burn best if the pool of wax is allowed to reach the outside of the jar during each use. This usually takes 3 to 5 hours. Keeping the wick trimmed to 1/8" - 1/4" will insure clean burning and no carbon buildup on the glass. Our Pillar Candles are designed to be self-consuming and non-dripping. They should be put on a plate, tray or specially designed pillar holder to contain any mishaps. Placing a pillar candle near a heat source (like stoves, heaters or other pillars) or near a draft will most likely affect its performance and may cause dripping.